Asakura"- Little Kyoto" SUBPAGE | All Japan Kyoto Association"
Asakura City sits at the center of Fukuoka Prefecture. More than half of the city is covered with forests and the city is blessed with a rich water source from the Chikugo River (the largest river on Kyushu Island). The Akizuki district is in the northern part of Asakura City and since its geographical situation is similar to that of Kyoto it is called a “Little Kyoto in Chikuzen.” It was developed as a castle town during the Sengoku Civil War period (end of 15th to end of 16th century). Historical remains can be found throughout the city attracting tourists from around Japan. The city has developed traditional industries such as natural plant dyeing, Kuzu plant, and handmade washi paper, all nurtured by the rich water source. For New Year’s Day, people in Asakura eat “Mushi Zoni” a savory steamed egg pudding with rice cake which is an unusual style of Zoni. Amagi Park is in the city area of Asakura and is also known as Maruyama Park (in total 31.7 hectares). This is a pleasant recreation park for the local people surrounded by rich nature. 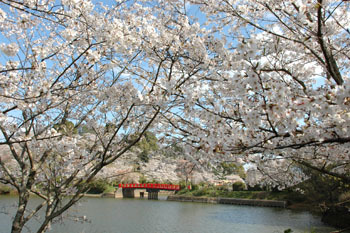 About 4,000 cherry trees surround the pond and they fill the park with splendid cherry blossoms all around. 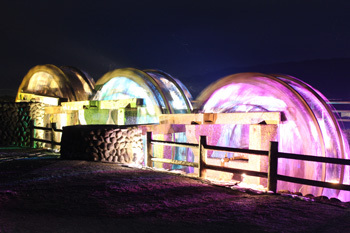 Night-time light up entertains visitors during the season. 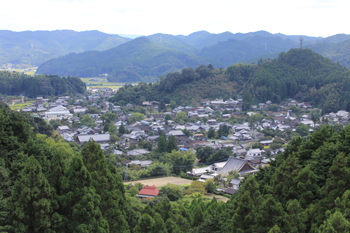 Akizuki is called a Little Kyoto in Chikuzen surrounded by mountains and blessed with a rich water source. Sugino Bana Street is the main street where many tourists enjoy strolling around. During the time when the Kuroda clan ruled over the region, there were a number of cedar trees around this street and it was also where samurai took care of their horses; this is how this street was named “Sugino (Cedar) Baba (place of taking care of horses).” About 200 cherry trees stand on the both sides of the 500-meter street. In spring, the cherry blossom tunnel fascinates tourists. Access Take the Amagi Railway train to Amagi Station and take the Amagi Sightseeing Bus (Akizuki Line) for 20 min. 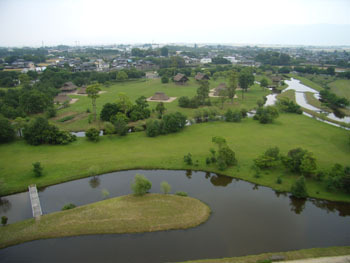 There are lowland ditched settlement remains from the Yayoi period (10th century B.C. to 3rd century A.D.) in this national park. The worship hall, residence of the village chief, pit houses, raised floor warehouse and some other buildings were reconstructed and the moat was refilled with water. Besides refashioning the buildings, an ancient forest has also been recreated. At the Experience Study Hall by the entrance, an introduction about the remains along with some hands-on experiences of ancient works such as magatama ancient bead making and fire making are available. 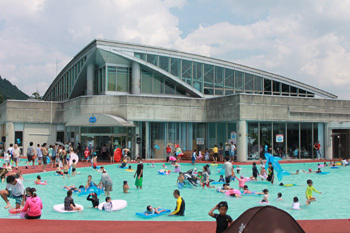 Amagi Water Culture Village is located by Terauchi Dam. Visitors can learn about the importance and wonders of water while playing. There is an Aquaculture Zone, Green Sport Zone, and Waterfront Zone. The outside roller slider is very popular among children. This is the place where people can enjoy themselves surrounded by a rich natural environment. 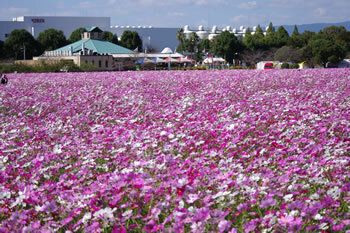 In the vast 7-hectare park, red and pink poppy flowers in spring and cosmos flowers in autumn welcome visitors. Access A 15-min. walk from Tachiarai Station on Amagi Railway, or take the Amagi Sightseeing Bus (Miwa Line) from Amagi Chuo and get off at Kirin Beer-mae stop. This market has a long history dating back to the Nara period (710-794). The deity of Ancho-ji Temple has been worshipped for avoiding smallpox and protecting children. There was a small drum depicting a child’s face which people kept as an amulet for avoiding smallpox and since this drum was called Batabata, the market started to be called Batabata market. 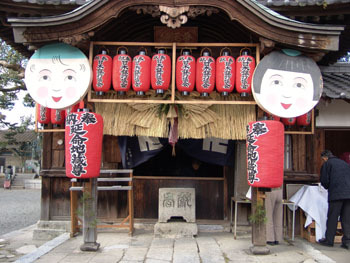 Batabata Market is a traditional event of Asakura passed on for several hundred years. The annual festival of Aso Shrine is called the Dorouchi Festival and is designated as an intangible cultural property of Fukuoka Prefecture. 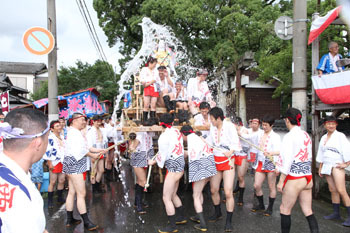 Twelve children throw mud balls to the shrine priest. It is believed that the more mud the priest gets the better the autumn harvest people will have. 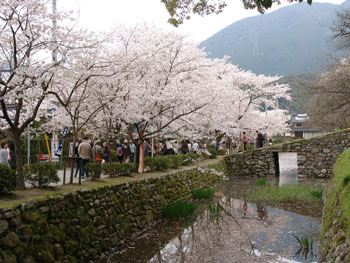 A large-scale spring festival held in Umezono Park in the Akizuki Castle Ruin during the height of the cherry blossoms. People parade around the town. Performances by the Hayashi School Kakae Ozutsu (hand-held big gun) and Kogetsu School Drum and many other stage events will be held. Akizuki is called a Little Kyoto in Chikuzen and is surrounded by mountains and blessed with a rich water source from the river. Sugino Bana Street is the main street where many tourists enjoy strolling around. 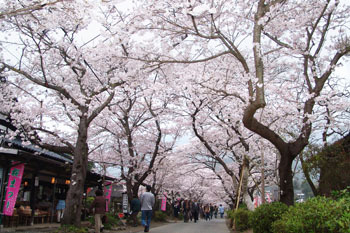 About 200 cherry trees stand on the both sides of the 500-meter street. In spring, the cherry blossom tunnel fascinates tourists and the night-time light is also greatly enjoyed by visitors. 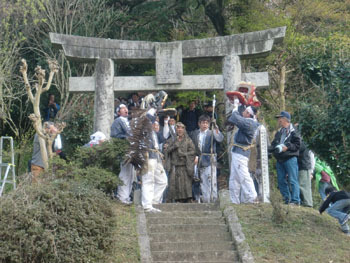 Yuzuki Shrine is located on the hill on the north side of Haki I.C. on the Oita Highway. 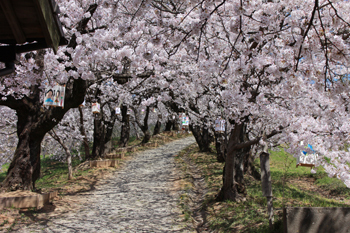 The 120-long approach from the shrine gate to the main hall will be lined with some 200 cherry trees. Night-time light up will also welcome people. 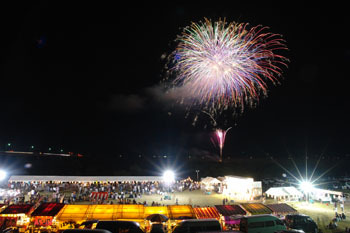 The firework festival and traditional Ukai cormorant fishing are two popular early summer events held around the Chikugo River. About 4,000 fireworks adorn the night sky every year. May 20 is the opening day of ayu (sweet fish) fishing. From this day until end of September, traditional Ukai cormorant fishing is also held on the river. The Gion Festival hosted by Suga Shrine has a history of about 300 years. When a serious plague prevailed in the city, people made mikoshi portable shrines and carried the spirit of the deity of Suga Shrine on the mikoshi and paraded around. The 3-meter tall two Yamagasa floats are massive and impressive. These three waterwheels are part of the city’s National Historic Site “Horikawa Moat and Asakura Waterwheels.” On the nights of Obon (Buddhist summer event in mid-August), the waterwheels will be elegantly lit-up. This custom started about a decade ago as a way of welcoming people who return to their hometown from afar and helping them remember the city’s symbol. Red, yellow and green lights make the waterwheel emanate a completely different ambience from the daytime. 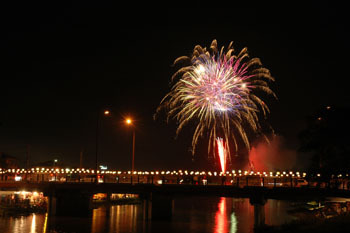 About 1,000 fireworks will displayed above Asaha Bridge. This is the only firework festival in which ten large 30-cm firework balls are set off in a row. A number of food stalls will be opened and many people enjoy this big summer event. This is a ceremony in which people pray for the deceased and a safe and healthy life for their family. 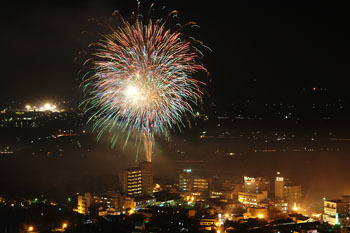 The main highlight is the fireworks (about 4,000) and a number of food stalls will be opened along the river bank. 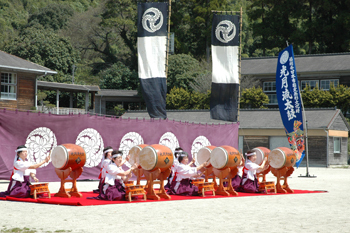 A wide array of Asakura City’s attractions will come together in this festival. 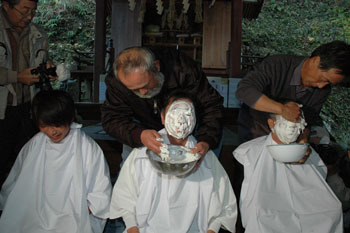 Enjoy the natural blessings of both river and forest and the history and tasty local specialties of Asakura. Many fun events are scheduled including traditional craft experiences and food stalls. 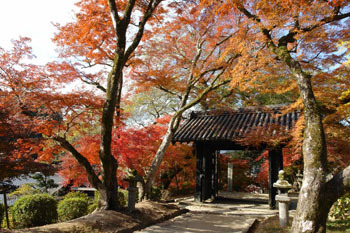 Around the Kuro-mon Gate of Akizuki Castle Ruins is one of the best colored leaf viewing spots in the city. About 20 Japanese maple trees turn deep red and create a superb contrast with the massive Koro-mon Gate. A number of tourists and photographers visit here to capture the beauty. A unique festival held on December 2nd every year. People apply powder on their faces and how good that year’s harvest will be is according to how much remains on their face. They are not allowed to remove the powder until they return home. Also, they must be sure not to let the powder fall in the fire as it will cause a fire in the house. On the other hand, mixing the powder into cow or horse feed can bring a safe and healthy life for the family. 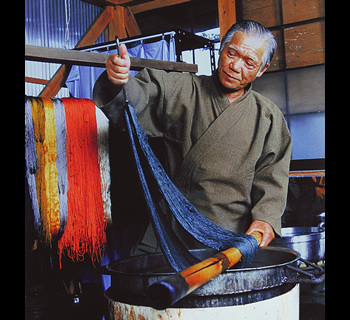 Natural play dyeing is one of the traditional crafts of Akizuki. Madder, chestnut, kuzu, felon herb, silver grass and many other plants around the area are used for dyeing fabrics. Stunning colors are born from the nature of Akizuki. The governor of Kuroda Domain encouraged the production of handmade washi. 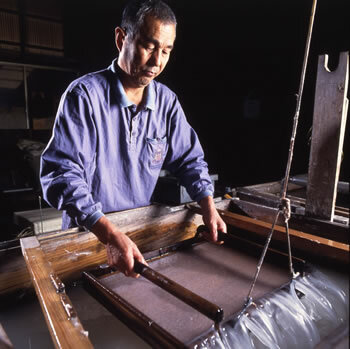 Making Akizuki Washi paper was a popular side-job of many samurai families. Paper made using the cold, clear stream of river water has a durable and distinctive texture. A historical record written in 1887 states that the origins of Amagi Shibori Tie-dye arrived in Asakura from Hakata. 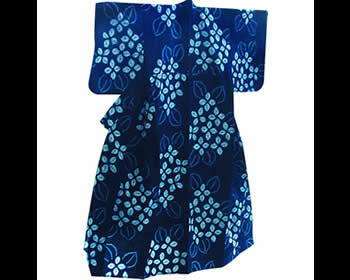 Both Hakata Shibori and Amagi Shibori have a long tradition dating back to the Edo period (17-19th century). Originally, it was called Chikuzen Shibori but later, from around 1924, it started to be called Amagi Shibori. The faint scent of a freshwater river and a texture like jelly are the characteristics of this weed. The academic name is “Suizenji Nori” and it can live only in completely pure fresh water. Today the weed is grown only in the Kogane River in Yanaga of Asakura City and is regarded as an extremely rare and valuable blessing from nature. Dried Suizenji Nori were highly valued and offered to the samurai master of Kuroda Domain. 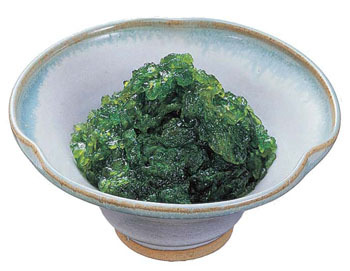 Suizenji Nori’s production method has remained unchanged for over 200 years. Kuzu is a plant which produces quality starch. 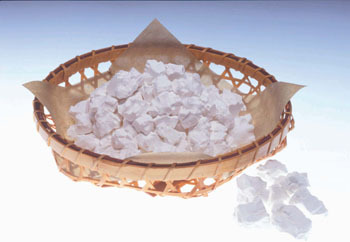 The production of Kuzu starch in Akizuki began in the mid-Edo period. In 1818, Kichibei Takagi visited the Kansai region and spent a few years learning how to produce Kishu Yasuda Kuzu. After returning to Akizuki, he invited skilled Kuzu specialists from Osaka and introduced them to the Yoshino Kuzu method. Fine Kuzu from Akizuki became famous and was often offered to the samurai master of Kuroda Domain and to the Tokugawa shogunate. Akizuki is still the main production area of quality Kuzu today. 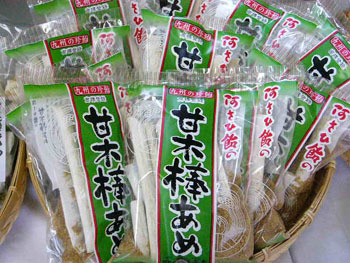 Bo-ame is a traditional handmade candy made from Minagi sugar, barley powder, soy bean powder, ginger and rice bran. It is said that the candy was brought in 1810 by a stone craftsman from Nagasaki who was involved in the construction of the Megane Bridge in Akizuki. Zoni is a soup with vegetables and rice cake which is eaten during the New Year days. The unique aspect of the Zoni in Asakura is that it is steamed which creates the appearance of an egg pudding instead of soup. In the mid-Edo period, Chawan-mushi (steamed savory egg pudding) was brought first to Nagasaki and then to Fukuoka. Since Fukuoka has many poultry farms, dishes using egg soon became popular. In the late Edo period (around 19th century), this egg pudding dish became popular in Asakura City, too, as a result of its close connection with Fukuoka Province. Since eggs were precious ingredients in those days, people could only afford to eat it during the New Year’s days as a special dish. As a result, steamed egg pudding began to be known as Zoni in Asakura.